How do you want to feel at the end of each workday? Probably not like you simply sat in an isolated cubicle, wiling away the hours. Or like you couldn’t concentrate because you were constantly distracted by the human beehive around you. More likely, you’d rather cross that last to-do off your list and high-five the CEO on your way out. After all, your office is more than just a place to occupy from nine to five, Monday through Friday – it should be a place that helps you succeed! 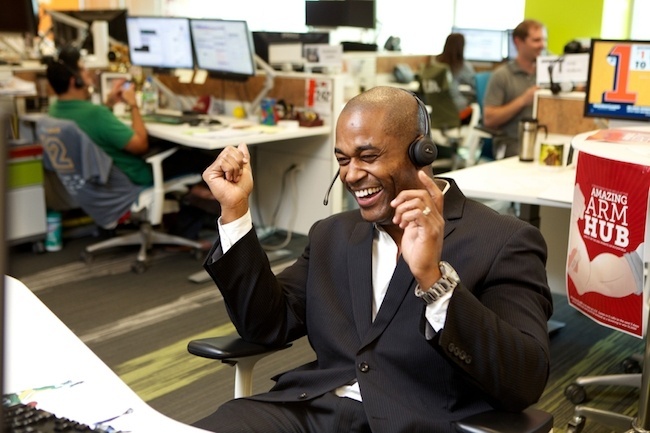 Your work environment is directly linked to your job performance and connection to company culture. 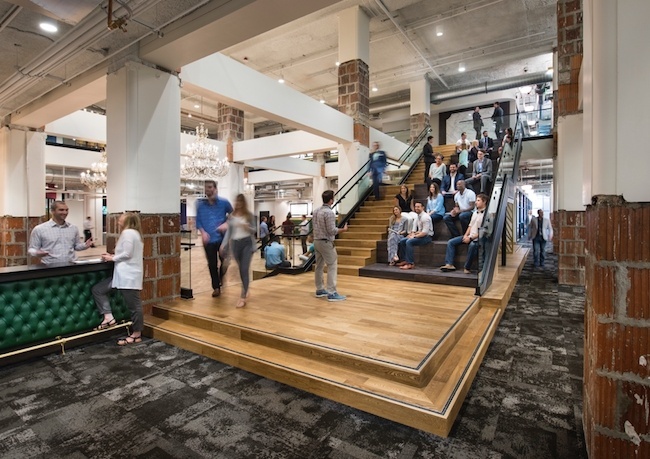 Here’s the tricky part: How can a space be designed to optimally benefit every type of person, role and workstyle? Initially considered the cure for the closed-off cubicle, the open office layout is widely popular due to its numerous benefits. It’s an efficient and economical use of space. 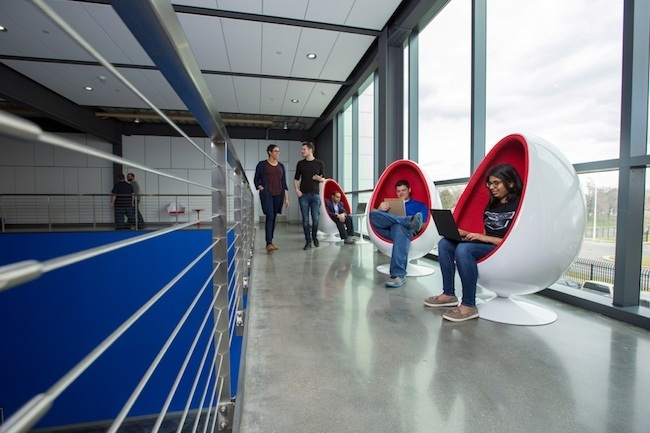 More importantly, it visually inspires a sense of corporate transparency, camaraderie among coworkers and an appreciation of each person’s contribution to the company’s broader purpose. 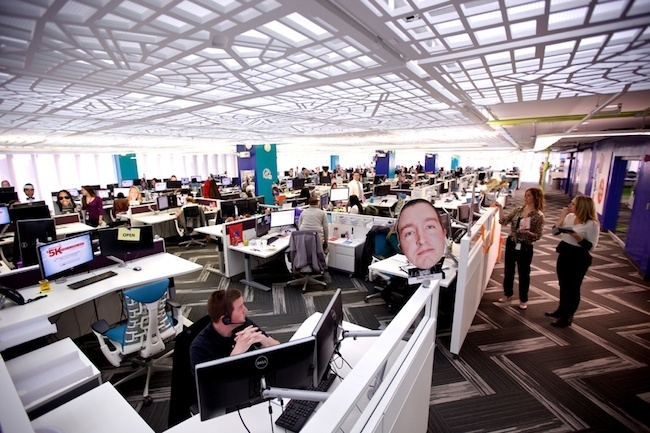 Today, almost 70% of American employees work in an open-office setting to increase collaboration. As it turns out, the noise and movement of all this collaboration can be over-stimulating, making concentration difficult and privacy unattainable. This can lead to stress and lowered productivity. Even so, companies known for their innovative cultures still gravitate toward the aesthetically sleek open office design. But here at Quicken Loans and our Family of Companies (FOC), we like to mix it up. Not only to increase productivity, but to provide team members with more control over their work environments. The True Solution is a Balanced Office. This is where the magic happens. Understanding how different spaces in a balanced office can support specific workstyles is the key to maximizing their effectiveness. You do this by creating spaces with various task-specific settings. 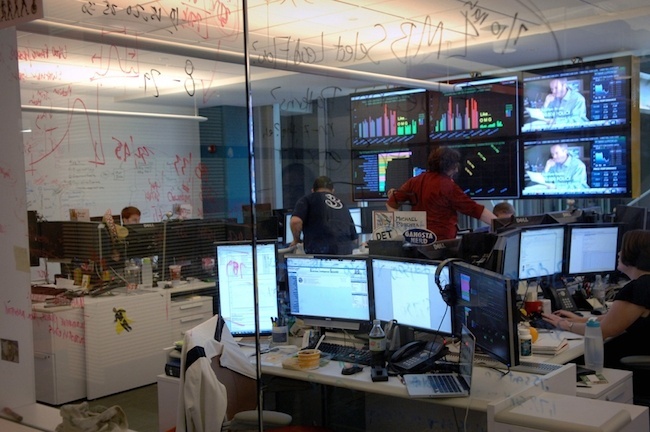 The basic concept of an open office is a large space filled with conjoined workstations. Here, you’re surrounded by activity at all times and highly accessible to coworkers wanting to chat. The good news is that authentic collaboration flourishes in these casual conversations. While you can accomplish a lot of different tasks in this type of setting, there’s very little privacy. Companies that prioritize transparency and engagement often view this setting as the best visual representation of their cultures. Not to be contradictory, but some people like the cubicle. Just maybe not all the time. These semi-secluded stations enable focused work and confidential conversations both visually and acoustically. Possibly more crucial, they offer increased privacy for those creativity-boosting activities that can sometimes seem off-task. A hybrid of the hub and pod settings, an enclave is a group office shared with a few of your most immediate team members. This smaller space motivates bonding and an intuitive work cycle, meaning you and your coworkers can create a natural rhythm of individual focus and collaboration. Think conference room- a central table surrounded by postured seating, arranged for deliberately collaborative conversation. Except this setting isn’t restricted to private rooms. It can be stationed in various areas and along high-traffic routes, so it’s easier to find a space for that long budget meeting or quick team huddle. Grabbing a cup of coffee to sit and talk with your team leader sounds pretty chill, right? 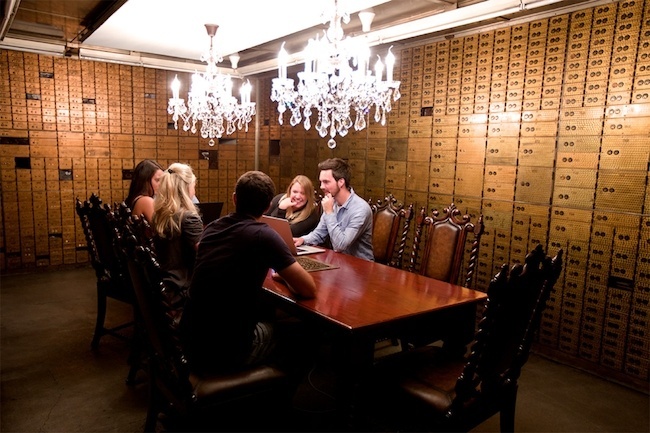 Much less intimidating than formally booking a conference room meeting. 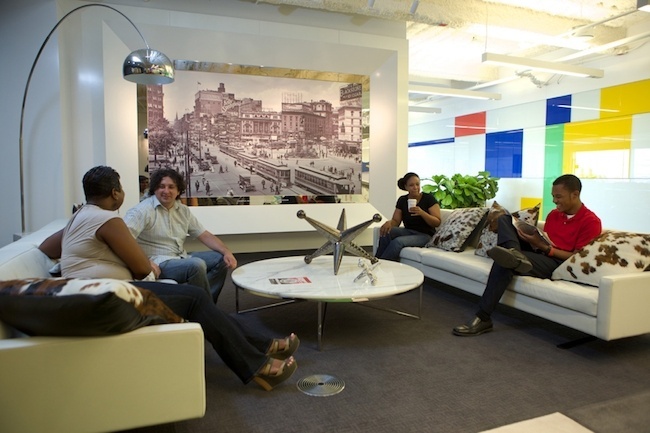 Comfortable seating arrangements along a workspace’s periphery supports more genuine socializing and increases team members’ comfort level in approaching one another. With comfy audience seating this setting accommodates presentations, training + other job-oriented events. Although it’s not supporting an active workstyle, per se, a designated seminar space ultimately serves your company’s investment in its team’s career development. Providing continued workforce education can increase job performance and employee dedication. It’s a win-win situation. By understanding how your workspace is designed to support productivity, you can more effectively leverage these settings to connect with your team and align with your company’s mission. Check out the QLCareers website to find some great opportunities in a workspace designed to boost your success. Sam Malott is the Adjective Architect for dPOP, creating content about workspace, productivity and employee happiness to inspire culture-driven companies. An avid researcher (and self-proclaimed expert Googler), she actively explores the latest trends, tools and technologies for enhancing space functionality to boost business. With a background in historic preservation, Sam loves fangirling over Detroit’s extraordinary compilation of architecture, and never turns down the opportunity to peruse an archival collection. 5 Benefits of Having More Women in Technology Want to see how women are making an impact in technology? Read on to learn more.